Juan Aguacate is a young agave farmer living in a beautiful village in Mexico. During his childhood he aspired to become a luchador just like his hero, who is loved by the entire village and who has a statue dedicated to him in the town square. He grew up hearing legends of this great fighter, stories that inspired him to become a respected warrior but he was unable to realize his dream. He ends up being a common man living in a common house on the edge of the village. Juan is in love with El-Presidente's daughter, the most beautiful girl in the village. On one festive day Juan leaves for the main village to profess his love to this maiden when he learns that she has been kidnapped by evil Calaca. Juan showing extraordinary courage goes after Calca to get her back but he is no match for his power and calca disposes juan quickly by killing him. But death was not the end of his journey. The strength which eluded him in his life, presents itself in his death. He is given a luchador mask by a strange woman that allows him to freely travel between the world of the living and the dead. Revitalized by this timely gift he wows to fight Calca and get back his love from his evil clutches. Guacamelee is a side scrolling open platformer in the style of metroid or castlevania. The gameplay is heavily tied to mechanic of shifting between the worlds of the living and the dead. At first the platforming sections are straight forward and it is usually clear when you need to shift. However it soon becomes tricky and there are times when you will need to shift on every jump in order to successfully navigate an area. Some platforming sections can become frustrating as you fiddle around with jump and shift button simultaneously, but with some practice you will start shifting like a real pro. The combat is hand to hand which makes sense since Juan is a luchador. And so there are several combos of jabs, kicks,cuts and throws that can be used in a fight. Like platforming some fights are straightforward where you can punch, kick, throw or do whatever you want to defeat the enemy. However as the game progress the enemies become more powerful and the fights become more complex. On some these tougher foes you need to perform a specific set of moves to soften them before you can do any damage to them. It becomes even more complex as enemies start to attack from different worlds which means in addition to a specific set of combos you must keep in mind what world you are in if you want to win the fight. Juan is nimble on his feet too. He can dodge any attack thrown at him. His rolls are quick and they can cover a fair amount of ground. They give him moments of invincibility during their duration. Besides dodging the enemy attacks rolls can also be used to navigate long strips of spikes. In many hard fights your survival depends on how well you time your rolls. The bosses in Guacamelee are spectacularly done. Flame face is a violent, boisterous character who keeps imbibing himself with alcohol. There is a recurring joke within the game when every time flame face confronts Juan he threatens him by firing bullets in the air. He fires two sets of three shots each and when his guns are empty he declares Juan to be lucky and absconds the battlefield to "fight another day". Javier Jaguar on the other hand is a fierce warrior and one of the toughest foes that you will fight in the game. He does not have any brashness of flame face. He treats his opponents with a weary respect. His demeanor inspires awe. You feel intimidated by him. The game does a fabulous job of managing the two extremes of characters. The brash rough attitude of Flame face and the serene reserve of Javier Jaguar. Of course there are other bosses but I will leave it to you to explore them. You are in for a treat. The music in guacamelee is astounding. It so perfectly captures the beautiful rustic atmosphere of a magical Mexican village. The tempo of the music changes between the two worlds. In the living world it is louder and more energetic. While in the world of dead it is distant,slow and melancholy. Though every tune in guacamelee deserves to be praised but there is one special song that is very close to my heart. I have long beaten the game but I still comeback from time to time just to listen to this tune. 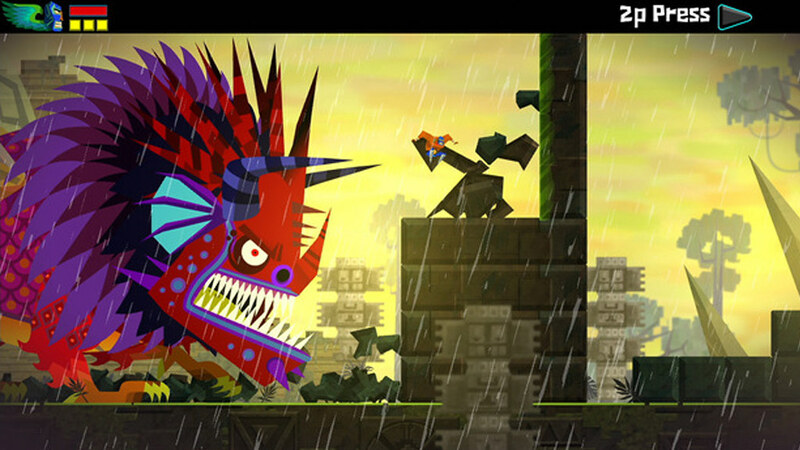 Though guacamelee deals with a rather morbid subject of death it does not feel heavy. It takes several digs at other metroidvania games and it is chock full of inside jokes that will make you smile. All things considered Guacamelee is one hell of a game. It is one of the best metroidvania games that I have played in ages.